The Art of Fugue is recorded here on two 8-string guitars, overdubbed with consummate artistic and technical skill. There is no artificiality in the result, and Eötvös is able to introduce subtle phrasing and articulation. To increase appreciation, and better understand the music, the second of the two CDs has extra features, accessed by exploring the readme.txt and start.html files on disc 2. 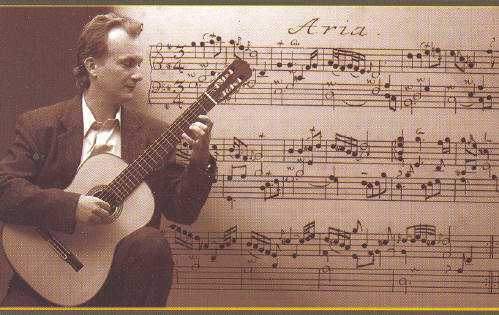 The music can be heard in two ways; a complete performance of the whole work on two guitars, with scores in Eotvos's edition to follow, alternatively the parts for one of the guitars are recorded separately for several of the tracks, for aspiring guitarists to 'play along' with Jozsef Eötvös. The result of it all is as idiomatic and lively rendering of The Art of Fugue as you will find, well recorded in an intimate acoustic, persuasive and untiring to hear at length. József Eötvös has not had an opportunity to visit UK and the time seems ripe for a world tour? * Samples of Jozsef Eötvös's playing can be heard on his website and his CDs can be purchased on line from Attacca Records.